Bakugan battle brawlers are small spheres that magnetically morph into powerful Bakugan warriors when they roll onto the metal Gate Cards. Use strategy to place your metal Gate Cards effectively as each card affects the battle differently. Then master your precision shooting skills to roll your Bakugan into battle and win. Use strategy to place you cards and set up for the challenge. 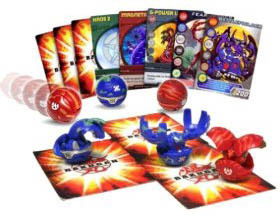 Starter kit includes two character cards, three normal cards, six Bakugan marble/action figures, two command cards, and one special ability card. Bakugan Battle Brawlers is one of those games that reaches out to fans of a television show and which allows the fans to enter into the show with their imaginations. Ideally, games like this will be played by fans of the TV series. Without a shared interest, it is not going to be sustainable. Cards are a big part of this game, as with many anime games. Cards, balls, powers, abilities, turn-based moves. All of these things correspond to both the television program and the video games.